This practical Arabic phrasebook puts all the most essential Arabic words and phrases in the palm of your hand. 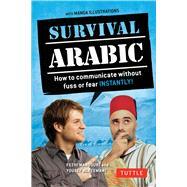 It contains all the necessary vocabulary for speaking Arabic in any setting. Perfect for students, tourists, or business people learning Arabic or traveling to the Arabic-speaking world, it also contains a beginner's guide to the Arabic language, allowing for a deeper understanding of Arabic than a typical Arabic phrasebook or Arabic dictionary. The phrasebook is organized by situations where one might need to speak Arabic such as: at the hotel, in a taxi, using numbers, etc. All Arabic words and phrases are written in Romanized form as well as Authentic Arabic script so that in the case of difficulties the book can be shown to an Arabic spreaker. Hundreds of useful Arabic words and expressions. Romanized forms, phonetic spellings, and Arabic script for all words and phrases. An introduction to the Arabic Alphabet. A pronunciation guide for Arabic letters and words. A guide to Arabic grammar. An Arabic dictionary for quick reference. Dr. Fethi Mansouri lectures in Middle Eastern Language and Culture Studies at Deakin University, Melbourne, Australia. He has conducted numerous studies on the learning and teaching of Arabic as a second language, and has also pioneered research on the mental and psychological aspects of learning Arabic. He has published many books on foreign language pedagogy and multicultural education.